What makes the Telluride Market Tick? Telluride's spring, summer and fall festival schedule, combined with numerous outdoor activities attract tourists/investors on a year-round basis to a resort where skiing is just one item on the recreational menu. Telluride is as attractive to the non-skier/investor as it is to the skier/investor. As a matter of fact, summer real estate sales often exceed those sales consummated during the winter months. The Telluride region is blessed with a most dramatic scenic backdrop. Much has been written in a variety of publications concerning the raw beauty of Telluride, e.g., "In a family of beauties, Telluride is the most stunning" - Boston Globe. In addition, nature's topographical layout enables three mountains and two towns to be joined by one ski area and a high-speed gondola transportation system. This plan has a European flair and, above all, diminishes the need for the bus and automobile. It is also unique that the Telluride Ski & Golf Company, master developer/owner/operator of the Telluride Mountain Village and Ski Resort, controls the property mid-mountain on its ski area. This enables the Village project to be entirely ski in and ski-out with a "commercial core" possessing perfect southwest solar exposure. Road & Air Access: Despite a reputation for being difficult to get to, the area offers an often under-appreciated ease of both driving & air access to Texas, Chicago, New Jersey, Scottsdale and now California with new low-cost routes to the Bay Area & Phoenix added just this year. Many familiar with trip believe that this misconception is what has preserved Telluride's remarkable beauty and rich character while other resorts sprawled over the past 20 years. 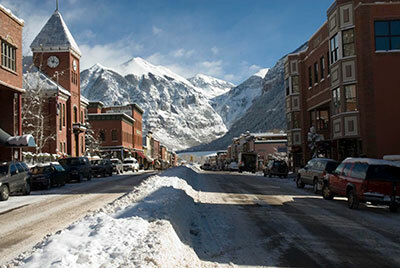 The Town of Telluride is one of less than 15 National Landmark Historic Districts in the United States, receiving high marks for fostering the historic character of a true 1800's Victorian-Era Colorado mining Town. Over the last four years Telluride Regional Airport has undergone $53 million in expansions & upgrades. The facilities already accommodate private and commercial aircraft as large as a G650 or Global Express.